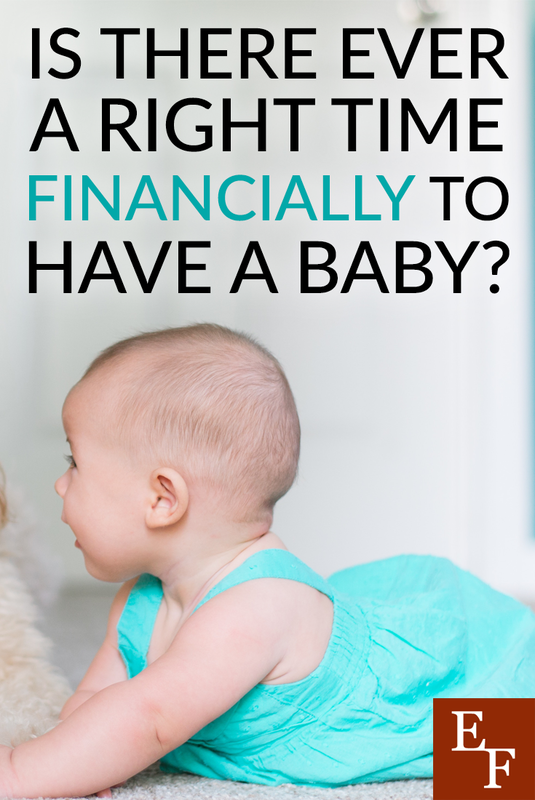 Is there ever a right time financially to have a baby? Having had an unplanned pregnancy before, I often ponder this question and I know many other parents do too. In the beginning, it was difficult raising a child without being financially stable. Even now that I am much better off financially, I still get nervous at the thought of being able to afford another child and meet all my other financial goals. Raising a child can be expensive and in the best case scenario, you want to have all your ducks in a row before you conceive. There are many factors to consider when having a child but finances happen to be one of the biggest ones. Simply put, it may never seem like the right time to have a child from a financial perspective. To make the transition easy, you need to prepare yourself to spend more on various things, save more, and possibly even earn more. Here are some financial considerations you should make before considering to grow your family. How Does Your Savings Account Look? Some sources claim that raising a child from 0 to age 18 can cost around $233,610 overall. Whether you agree with this figure or not, it’s important to acknowledge that fact that you’re going to need to save more money to cover the expected and unexpected costs of raising a child. You may want to start setting aside money for college, but most important, you should be increasing your emergency fund. When you add an extra person to your household, the risk of being faced with an emergency expense increased. While you may have felt comfortable with 3 months of expenses saved up with kids, you may want to bump your savings up to 6-12 months of expenses once you have a child. Creating a “baby fund” early on can also help cover regular expenses for supplies, clothes, food, etc. that you’ll need for the baby during the early months. Having more saved will help prevent you from getting into debt and borrowing money to support different areas of your child’s life. Also, you want to consider your own retirement. Will having a child deter you from being able to retire at a suitable age? If you’re at the place in life where you can afford to save more, it will help tremendously once you have a baby. One expense that can blindside new parents is medical bills from the hospital. During the pregnancy, mom will have to attend numerous doctor’s visits and take a few tests. Then, there’s the actual cost of the birth to consider, According to a study conducted by researchers from the University of California and referenced by NerdWallet the cost of an uncomplicated vaginal birth varied widely — from $3,296 to $37,227 depending on the hospital. Cesarean sections ranged from $8,312 to almost $71,000. Given these costs, it’s crucial to be enrolled in a quality health insurance plan to help reduce your out-of-pocket costs. If you’re thinking about having a child, you definitely want to have good medical insurance and visit with in-network doctors. Even then, it’s good to be prepared to pay for medical costs that insurance might not cover. You don’t need to own a home to have a baby, but you do need stable housing that can accommodate an infant. Infants need space for supplies and baby gear, and as they grow up kids need space to run around. If you’re going to buy a home, make sure it fits within your budget and you move and settle in before having the baby. Making a down payment of at least 20% can help you avoid costly private mortgage insurance. When it comes to transportation, you’ll want to make sure you can afford to get the baby to routine doctor’s appointments and for shots during the first year. You don’t have to own a car, but it does help to have your own vehicle to safely secure the car seat. You may even need to upgrade to a bigger car or one that safer for kids. Figuring out who will take care of your child can be stressful especially if both you and your partner need to work. Childcare centers are often the first option if family and friends can’t help care for the child during work hours. Childcare is expensive but even more costly for infants. According to Baby Center, the average cost of center-based daycare in the United States is $11,666 per year ($972 a month), but prices range from $3,582 to $18,773 a year ($300 to $1,564 monthly). As you can see, it’s easy for childcare costs to surpass your monthly grocery, rent, or mortgage amount which makes it a huge financial burden on some families. There are some state-funded daycare assistance programs available to help you cut these costs, but many of them are income-based. If your income exceeds the limit, you’ll probably have to budget to cover the costs of care all on your own. Technically, your baby can start attending childcare when they are as young as 6 weeks, but some parents prefer to take a longer maternity leave so their child doesn’t have to attend daycare that young. If you prefer to take a few months off from work to be with your baby, you’ll need to arrange terms with your job and save up to cover expenses during the weeks that you’re not working. If you would actually like to stay at home with your child for the time being and drop down to a one-income household, you’ll need to talk with your partner and make sure you can afford it. You can rely on solutions like extra savings, a raise, cutting expenses, or even obtaining a flexible part-time job to make ends meet. Having a child often means expenses will increase and money could get tighter. But, the key is to prepare your finances and plan ahead. The best time to have a child from a money perspective is when you are financially stable and prepared to take on the responsibility.